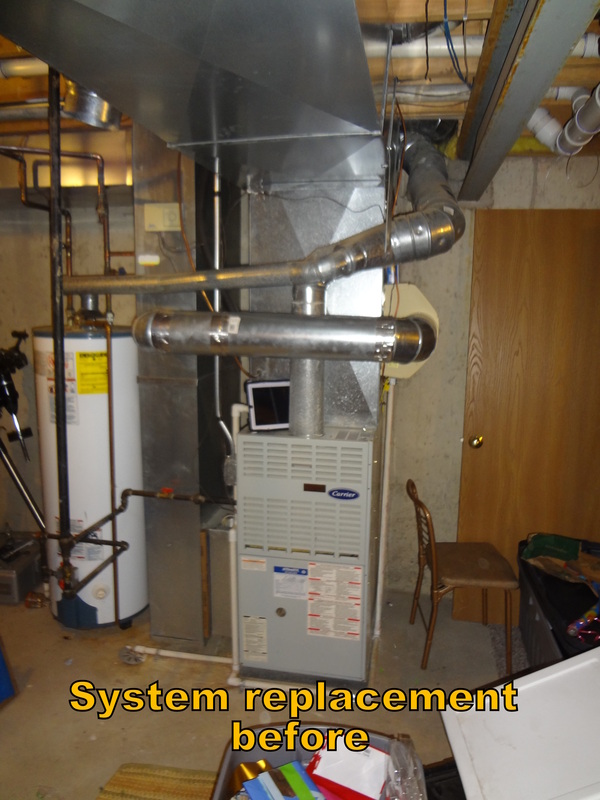 Real Life Stories - HVAC: Kenna Heat Cool Solutions Inc.
We sealed ducts in the McCune’s basement in January. The first day we were wearing t-shirts and sweating, the second day we needed hoodies because after sealing the ducts, the temperature in the basement dropped about 20 degrees. All the heat lost in the basement is now being delivered where they want it. The Leahy’s dryer wouldn’t dry clothes and the dryer vent was plugged with lint, creating a potential fire hazard. 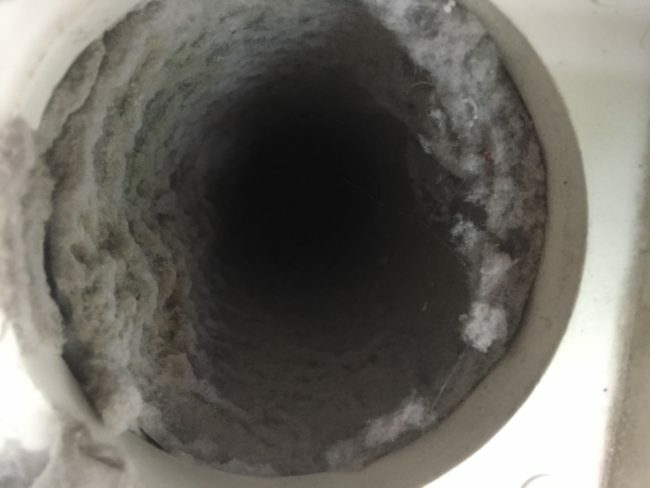 The dryer vent was about 85 feet long (most dryers are capable of pushing lint out through a vent that is 15 to 20 feet long). There was no viable solution to relocate the dryer. We cleaned the dryer vent and installed a dryer booster fan which turns on whenever the dryer operates. The booster fan can push dryer lint up to 160 feet. The dryer now dries properly and is no longer a fire hazard. The Sullivan’s had a cold sunroom that was heated by electric baseboards, and a cold laundry room in the basement that was not piped correctly to the boiler. Numerous contractors tried to fix the piping in the laundry room but it still didn’t heat well. We removed the electric baseboards in the sunroom and installed water baseboards that connect to the boiler. We installed two dedicated heating zones, one for the laundry room and one for the sunroom. Each zone is controlled by a dedicated thermostat and now delivers comfortable heat. Erin and Steve of Antioch had an intermittent heating problem where the furnace would turn off after running for only twenty minutes. We found that the PVC pipe venting to the outside was not supported correctly, creating a water trap. 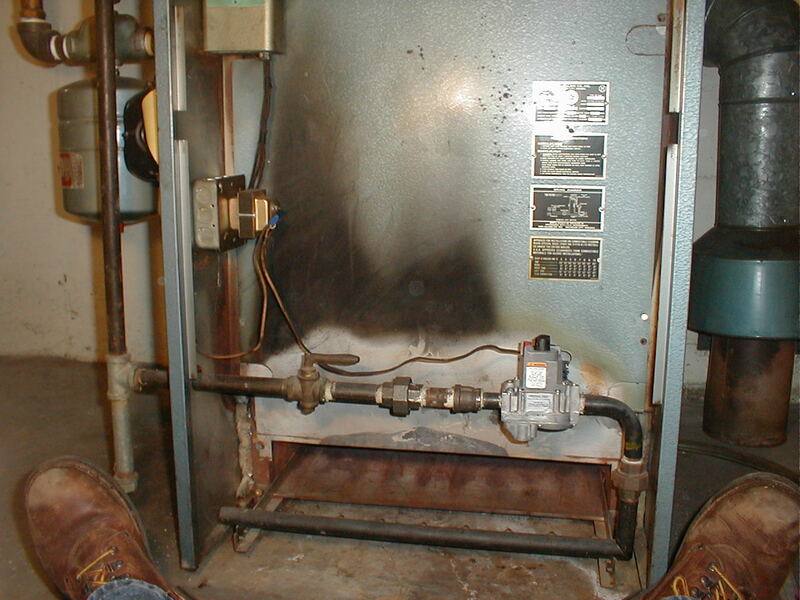 The furnace gases were not venting, causing it to stop after twenty minutes. We supported and re-pitched the pipe and removed eight gallons of water that was clogging the pipe. Now the Furnace is running more efficiently and enduring less wear and tear. Tom and Janet own two apartment buildings in Libertyville and had numerous “too hot” or “too cold” complaints from tenants. The one thermostat for each building was located in a tenants apartment. I installed a Wi-Fi enabled thermostat in each building which is now located in the mechanical room and receives temperature inputs from six different sensors throughout each building. This averages the temperature and gives more precise temperature control. Tom and Janet can control the temperature remotely with an app and get alerts when the system is not performing as they specified. Each apartment enjoys more even temperature and Tom and Janet have less headaches. In the ten years Marvin and Sara lived in their Highland Park home, it always took twenty minutes to get hot water in the master bathroom. Three other contractors said they would have to re-pipe all the plumbing in the whole house, which was quoted at over $10,000. I installed a circulation pump on their water heater which circulates hot water throughout the home, and a bypass valve between the hot and cold water lines in their bathroom. It worked. They now have instant hot water and a lower water bill. Concerns: Bob and Nina Swanson of Glenview were worried about the safety of their son in his new basement bedroom; particularly the the carbon monoxide levels of the water heater and boiler. Investigation: Before cleaning the thirty-year old boiler, I used a combustion gas analyzer to calculate the system efficiency and carbon monoxide levels. It determined that the efficiency was less than 50% and the boiler was producing unsafe levels of carbon monoxide, almost 1000 parts per million (maximum safe level is 400 parts per million). If there ever was a problem with the chimney drafting improperly, the current carbon monoxide level could poison a person in a matter of hours. Solutions: I installed a safety switch on the water heater that would shut it down if the gases didn’t vent. I cleaned and calibrated the boiler and retested it with the combustion gas analyzer. It calculated that the efficiency is 75% (very good for a thirty year old boiler) and the carbon monoxide level is down to 5 parts per million. Benefits: The Swanson’s are confident that their water heater and boiler will not give their son (or them) carbon monoxide poisoning. The improved boiler efficiency will lower their gas bills. Denise of Lake Villa called me for a sales estimate for a new air conditioning system which had not been working for over a year. Two other hvac contractors said she had a bad compressor, which is a major component, and needed to replace the entire system. I checked out the system and found that the compressor was operational but the circuit breaker was undersized and couldn’t handle the power the a/c required. I installed a start-assist kit which reduces the consumption of power below requirements of the circuit breaker. 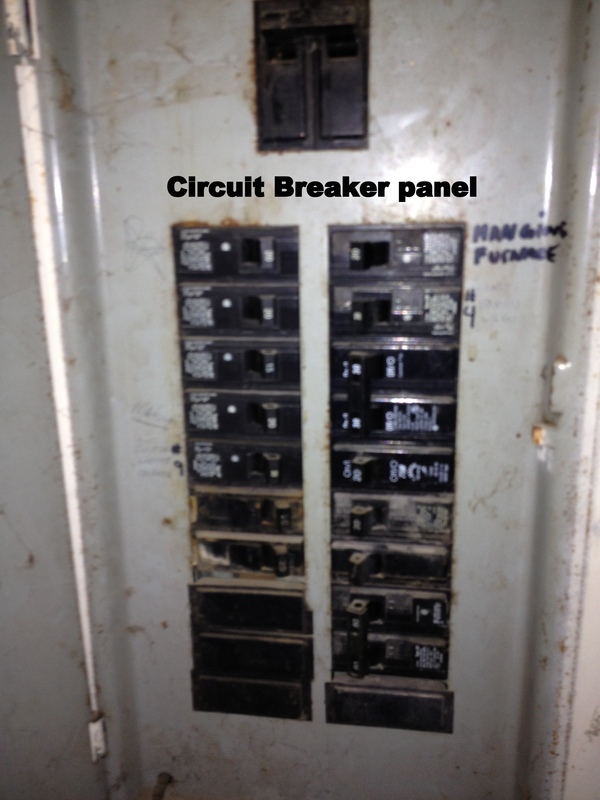 I recommended to eventually replace the circuit breaker. Total cost to replace the breaker and upgrade the electrical is about $360 vs. a few thousand for a new system. She was amazed and thrilled to have her “dead” system working again, especially for less than $150. Wayne Blanchette of Antioch has a forty-year old boiler and believed only an “old timer” could properly clean and check it. 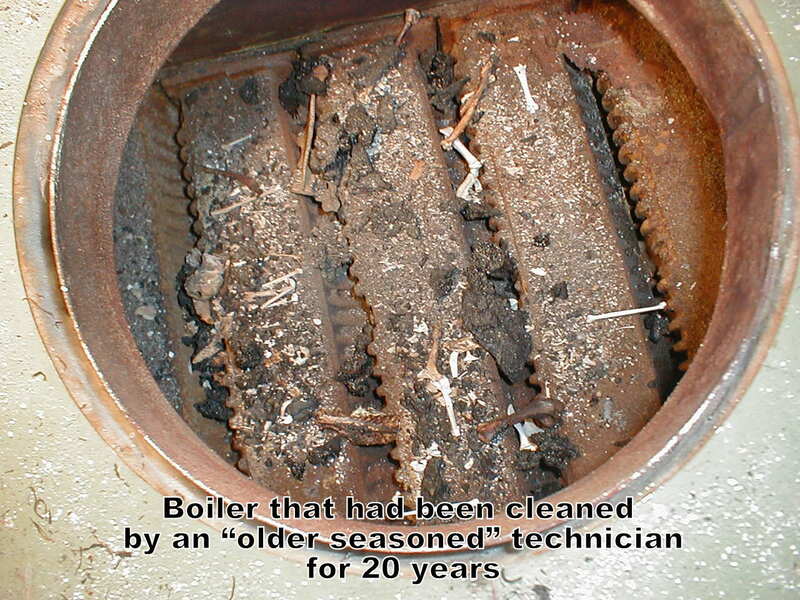 Inside of dirty boiler that was previously maintained by another professional. It has quite a collection of bones. I met him while servicing his neighbors air conditioner. As we talked, my passion and knowledge about boilers convinced him to give me a shot. As I disassembled his boiler, Wayne asked what I was doing, as no one else had thoroughly cleaned it like that. 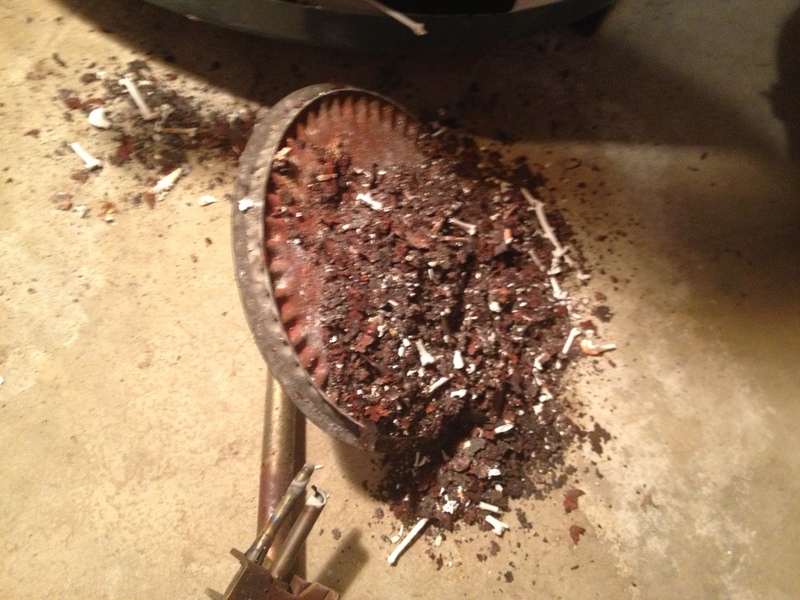 He was shocked to see the years of soot and dirt that had accumulated on top of the boiler block; it was enough to plug my six gallon shop-vac. The combustion gas analyzer (a test performed before and after cleaning) showed a 12% increase in efficiency, which will lower his gas consumption by 12%. The system is burning cleaner and less likely to produce carbon monoxide. 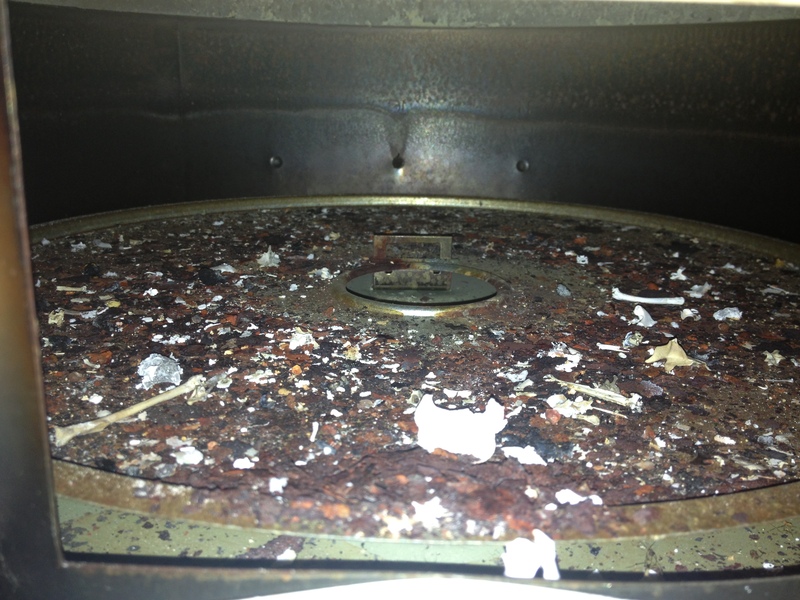 Concerns: The story of the Grablin’s of Gurnee began with an annual cleaning of their aging furnace and humidifier. I asked about their comfort and they mentioned some things that concerned them: They had numerous hot and cold spots throughout the house. The second floor never got cool enough in the summer. Some areas were colder than they should be in the winter. They resorted to wearing jackets in the wintertime to stay warm. The furnace was very noisy and running too short or too long. The new hardwood floor was separating and their kids were getting bloody noses. They wanted to improve the air quality, particularly with two dogs and a son with allergies. cracks and the water line to the humidifier was plugged with debris. I performed a heat loss calculation, surveyed the duct work and inspected the whole house and determined that the furnace was 60% oversized; it was heating unevenly, inefficiently and loudly. The air conditioner was undersized. The return air ducts were 34% undersized and improperly configured; it was pulling some air from the wrong places, the crawl space and attic, which diminished air quality. The supply air duct system was not balanced causing poor air flow and uneven heating. We discussed repairing or replacing; they decided replacing and upgrading would greatly improve their comfort and lower their utility bills. 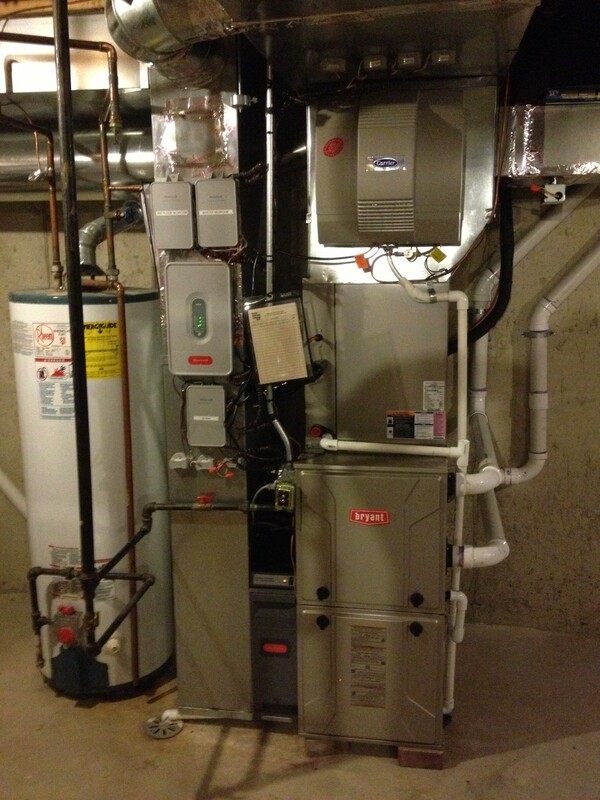 Installation of properly sized, high efficiency, two stage furnace and air conditioner. 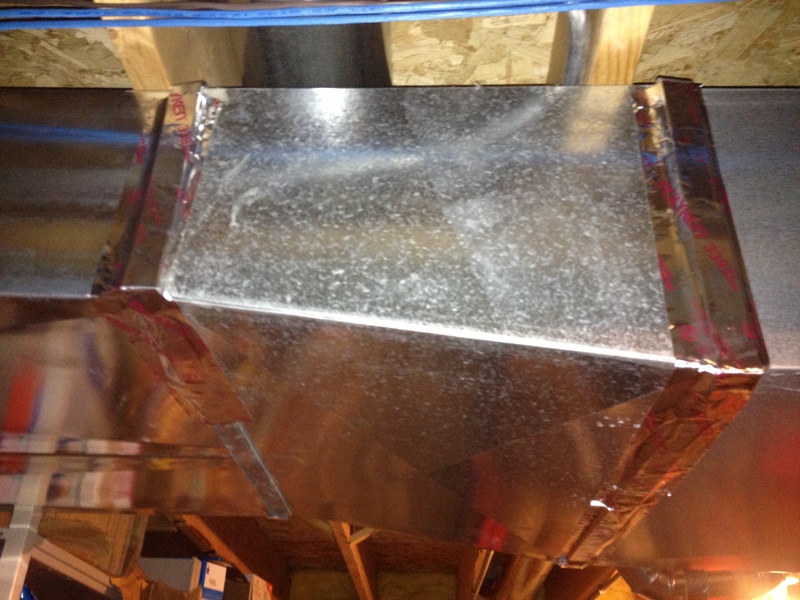 Additional, custom-designed, and sealed supply and return air duct system. Three independent heating and cooling zones with thermostats. A humidifier and whole house electronic air cleaner. Benefits: They now have a quiet, integrated system that delivers even temperature, proper humidity and cleaner air. They no longer need jackets in the house. They are able to keep their thermostats a comfortable 65 degrees throughout; they can keep their master bedroom colder, as they prefer, without worrying about freezing their kids. Within six weeks the air cleaner has trapped a lot of particles, the house is less dusty and their allergic son no longer suffers through winter with a continually runny nose. Their gas usage went down. The bloody noses have stopped and the floors are coming back together. They can remotely adjust the thermostat and other settings from anywhere in the world, and are notified by text if there are any problems such as it being too hot or too cold. Problems: Art Scalzitti of Gurnee informed me that the furnace was exploding when it came on and was so loud it scared him. I turned off the furnace and did a visual inspection to find the furnace was very dirty (it had been 10 years since the last cleaning). This was the source of many problems. Investigation: The pilot flame was not igniting the main burners. Natural gas was building up, filling the furnace, then it would explode dramatically causing the furnace and the ducts to shake. 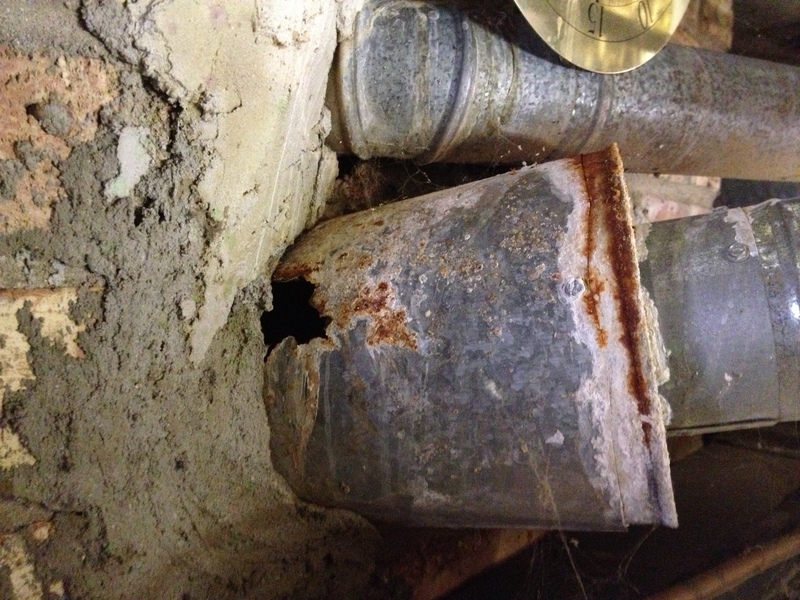 The pipe that goes from the furnace to the chimney was severely rusted with several large holes. One section of the furnace was plugged with soot, causing the chimney pipe to rust due to an improper mixture of gas and air. The flue gases were not getting out of the chimney pipe quickly enough because of their high acidic content causing the chimney pipe to fall apart. Carbon monoxide was venting into the house instead of up the flue. Solutions: Over the next 4 hours I cleaned and inspected the heat exchanger, burners and pilot burner, checked gas pressure, temperature rise and replaced the chimney pipe and checked the draft on the older Carrier furnace. Benefits: The Scalzittt’s furnace safely functions again. Art and his family realized how catastrophic the problem could have been after seeing with their own eyes the soot removed and possible carbon monoxide poisoning they avoided. I was at a clients’ for a cleaning and they complained that every time the furnace came on the duct work would bang. I asked them how the noise had been going on and they said, “It’s always done that” – they have lived there for over 20 years. I walked around their home with them and found several ducts were blocked by furniture. I moved the furniture so air could get into the ducts and the system got quiet and did not bang anymore. The Zumwalt’s of Libertyville had just moved into their new home and had me check out the a/c systems and upgrade their thermostats. As I walked by the dryer vent flap, I noticed it was stuck open and had lint in the hood. I recommended cleaning the dryer vent because of the potential fire hazard. 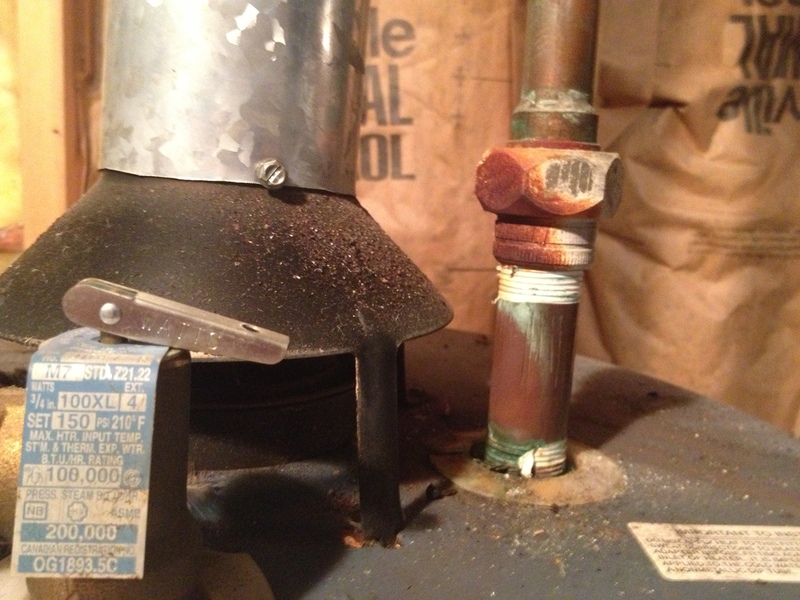 As I worked nearby, I noticed discoloration on the water pipe on top of the water heater. This is a sign of a potentially dangerous problem; flue gases not going up the chimney and instead going into the home (see pictures). Mr. & Mrs. Zumwalt again agreed to for me to further investigate. I pulled the burner out of the water heater to find it was completely covered with debris, affecting how the burner worked. I also removed the flue pipe to inspect for any blockage. I found a bird in the pipe. I cleaned the entire water heater and removed the bird from the flue pipe. I reassembled and tested the water heater for proper operation and draft. Both now checked out good. I followed up with Mr. & Mrs. Zumwalt a few days later. They commented how well the dryer now works and thanked me for keeping them, their children and their home safe.